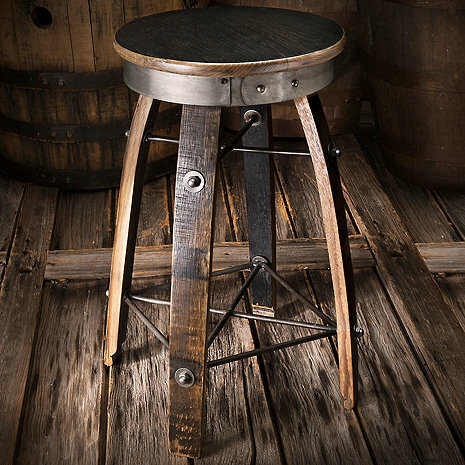 Handcrafted from reclaimed "Whiskey" barrel wood, original iron barrel hoop and a swivel seat, this unique bar stool will make a striking addition to any bar, counter top, high-top table or studio space. At 24" tall, the artisan forged iron provides a most comfortable footrest! Can these stools be made at bar height of 28”? BEST ANSWER: The Bourbon Barrel Stave Swivel Stool is only available in the 24 inch high stool. We do offer other swivel stools that measure 28 inches. 24" is the maximum height. We purchased three of the Bourbon Barrel Stave Swivel Stools to place at an island in a second kitchen. The go perfectly with the decor and are very handsome. A nice addition to the room. PERFECT! We absolutely love them! We ordered 3 of these stools after reading the other reviews. They are heavy duty, beautifully designed and unique. Love the mix of wood and metal. The coloring is perfect - slightly distressed with hues of brown and black. Love them!